If you are expecting a child and dreaming of a name with double letters within it, this is your ultimate resource. This list contains baby girl names that contain the letter sequences "ee", "ll", "nn", "rr", "ss", and "tt". 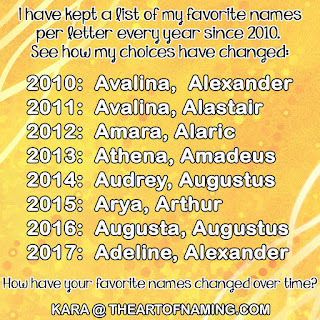 You're sure to find a great double-lettered name here but keep in mind that this list doesn't feature every possible name out there, just some of the best options available! Which do you like most? Stay tuned for a list of the best double-lettered names for every letter! 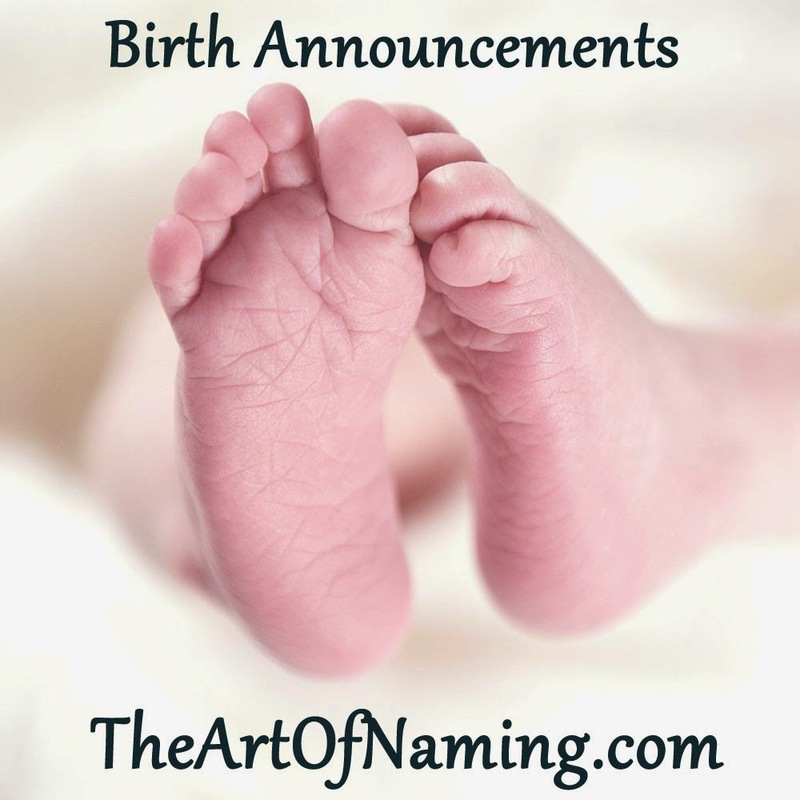 Birth announcements can be even more telling of what names are actually being used than even the most official lists of statistics and data. The US Top 1000 chart may show the most popular names, one spelling of that name at at time, but it does not make any mention of middle names. I like to see name combinations: firsts and middles put together. Did you see all those Roses? It seems to be a very popular choice! And then there's the adorable and old-fashioned middles like Sue, Joan, and Mae. Which of the following names do you like best? For the boys, I was surprised to see so many "proper old man" type names in the middle spot: Edsel, Edward, Richard, Gerald, Kenneth, Harold, John, and so on. There are actually 3 Geralds on the list! What do you think of the boy names? Like any? What do you think of matchy names for twins? Are Ezra and Elsa a little too similar or do they work well? What do you think? Tell me your favorites by leaving your thoughts in the comment section below or on our Facebook page! To round out Italian Week, let's take a look at a lovely Italian girl name: Luciana. This name not only has Italian usage, but also Spanish, Portuguese and Ancient Roman. It is the feminine form of the Latin Lucianus which is a Roman family name. It is derived from Lucius which comes from the Latin word lux meaning "light". For girls, names like Lucia, Lucilla, Lucetta, Lucinda, Lucienne and Lucy are all related to Luciana. 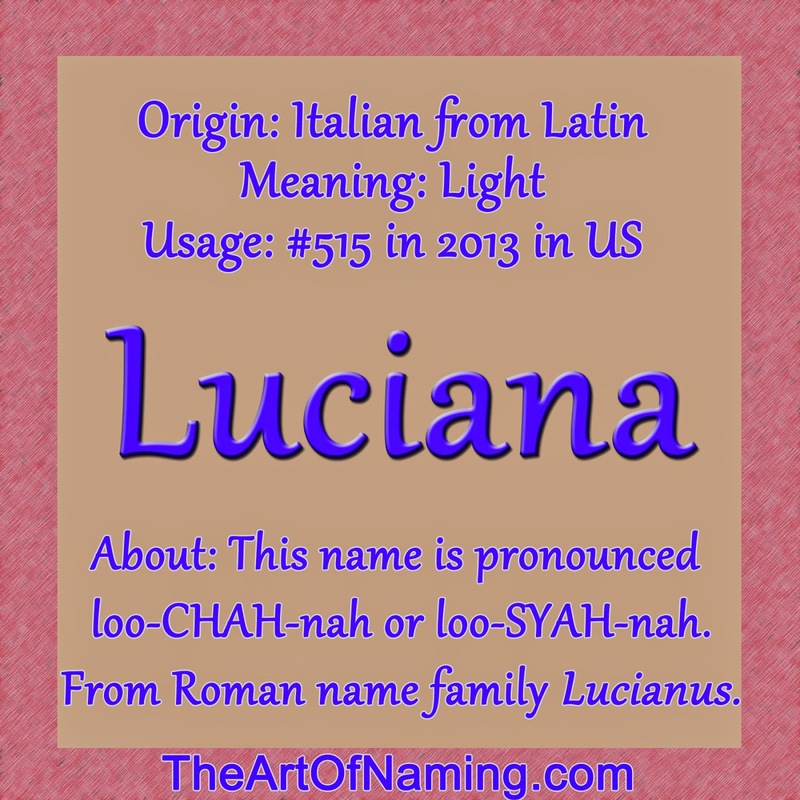 Male variations include Luciano, Lucianus, Lucius, Lucio and Lucian. Of these, Lucia is hot in Spain. Luciana has a couple different pronunciations. The Italians say loo-CHAH-nah and the Spanish will say loo-THYAH-nah or loo-SYAH-nah. You'll probably hear the last one most in the US. In the US, Luciana has occasionally been used since 1897. It was very sporadic and with only a handful of births per year until there was a sudden boost from 1974-1977. 1976 was the biggest year with 317 births and a ranking of #546. Luciana has only ranked in the Top 1000 from 1974-1976 and from 2006 -2013. Most recently, there were 572 births in 2013 for a ranking of #515. This is the most the name has ever been used! With Lucy being an appealing nickname, Lucia (#241) and Luciana will probably continue to gain usage in the near future. Family is very important in Italy. So much so that there has been a very strong custom in place for how parents are expected to name their children. The first male is named after his paternal grandfather. The second male is named after his maternal grandfather. The first female is named after her paternal grandmother. The second female is named after her maternal grandmother. Any further children would then be named either for their parents, for a favorite aunt or uncle, for a saint, or for a deceased relative. There are always exceptions to this custom but this is typically the pattern that has been traditionally in use. If there was a child who died at a young age, for instance the first born son Emilio, his name would probably be reused for the next boy that was born in order to honor his paternal grandfather Emilio again. Sometimes if the first born was a girl, they'd use a female variation of the paternal grandfather's name. The pattern wasn't always followed in the exact same way from family to family. This makes predicting ancestry records a bit more complicated than you may expect. These traditions could be confusing when more than one of a man's sons named their first born sons after him. Then you'd have cousins with the same name. This happened frequently so to distinguish the boys from one another, nicknames were used. In some small towns where naming traditions are still upheld, the nickname trend is still in use. These nicknames tend to come from some kind of personal characteristic among other things. If the above traditions weren't followed for some reason, you could probably bet money that the children all had a saint's name, especially if the family was Italian Catholic. The majority of typical male Italian names end in -o but there are some that also end in -e, -a or -i like Salvatore, Luca or Giovanni. If it ever ends with a consonant, the origin is probably foreign such as Cristian or Oscar. Female names mostly end with -a but there are also some that end with -e or -i. Often, names will have a diminutive ending on them such as -ino/-ina, -etto/-etta, -ello/-ella, or -uccio/-uccia. Many male names have the prefix Gian- (John) or Pier- (Peter) in names like Gianluca or Giancarlo and Pierpaolo or Pierangelo. The feminine name Maria was also occasionally given to boys like Gianmaria or Anton Maria. For males: Marco, Giuseppe, Antonio, Luca, Alessandro, Giovanni, Roberto, Andrea, Stefano, Francesco, Mario, Luigi. For females: Anna, Maria, Sara, Laura, Valentina, Giulia, Rosa, Giuseppina, Angela, Giovanna. Modern Italian names may have roots that come from ancient Latin names, but they tend to not be entirely equivalent. Most Latin-based origins such as Italian, Spanish, and French will have some correlation, of course, but there tends to be a big stylistic difference between names viewed as Italian and names considered Latin or Roman. Ancient Romans had a limited inventory of given names that they used so very few modern Italian names are actually derived directly from the classical Roman names. As far as surnames go, Italians actually have the largest collection of surnames in the world. There are over 350,000 surnames in use. Men in ancient Rome began to inherit a specific surname around the year 1450. In 1564, it became mandatory to register baptismal names and marriages in parishes. A very large amount of Italian surnames end with the letter -i. This is said to have started as a medieval habit of identifying a whole family by pluralizing their name with the letter -i on the end. Even if the family name was Ormanno, they were known as the Ormanni. So Lorenzo from the Ormanno family would be known as Lorenzo degli Ormanni which means "Lorenzo of the Ormannos". Eventually, the possessive portion of the name phrase that was used to identify someone ("of the") was dropped. They just remained pluralized: Lorenzo of the Ormannos was just Lorenzo Ormanni. Many of these family names were originally rather patronymic indicating ancestry through the paternal line such as Francesco de Bernardo meaning "Francis the son of Bernard". He would later just be known as Francesco Bernardi. Some surnames originated as place names. People would only have first names and they'd be known by where they lived, whether it was a town, a geographical marker like a mountain or some other landmark like a tower. For example, the Rosa who lived in the town of Vinci would eventually be named Rosa da Vinci. Sometimes, ancestors' occupations determined a surname: Contadino which means "farmer" or Marin which means "sea" and indicates a fisherman. Other times, physical characteristics gave rise to surnames: Rossi comes from rosso which means "redhead". Occasionally, you'll find an Italian family surname that has preserved its Medieval Latin form such as De Laurentiis. What do you think of these Italian baby names? For an even more extensive list of traditional name ideas, be sure to look at Behind The Name's wonderful list. [Note:] As far as I know, I am not Italian. I have never had the pleasure of visiting Italy and I unfortunately have never learned the language. If any of this information is incorrect or lacking, please let me know so corrections can be made. Welcome to Italian week! 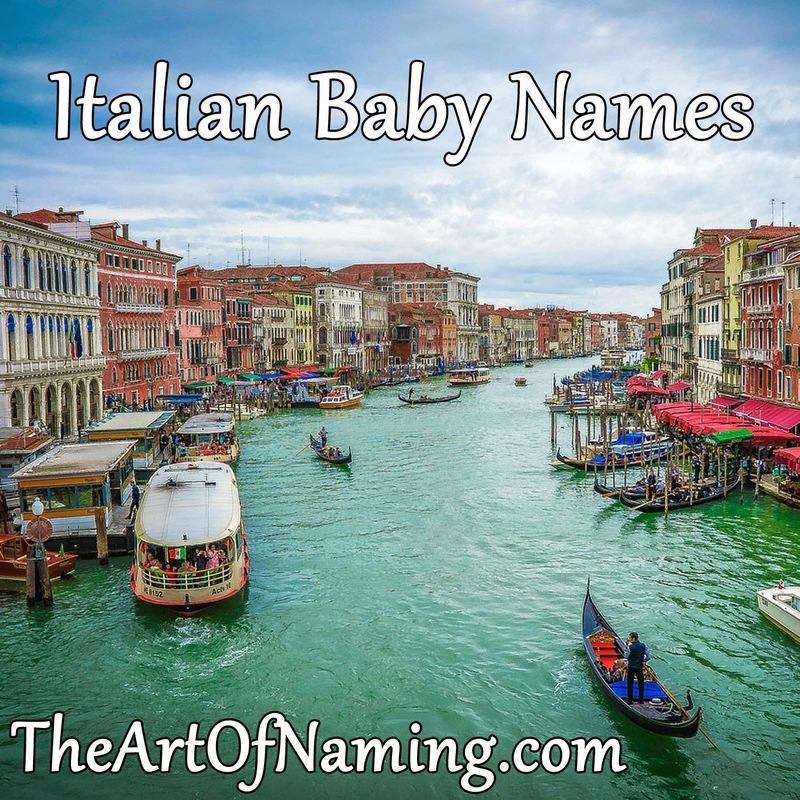 On Wednesday, we'll look at Italian baby naming traditions, and Friday will bring a lovely girls name. Today, we're looking at the Italian boy name Lorenzo. 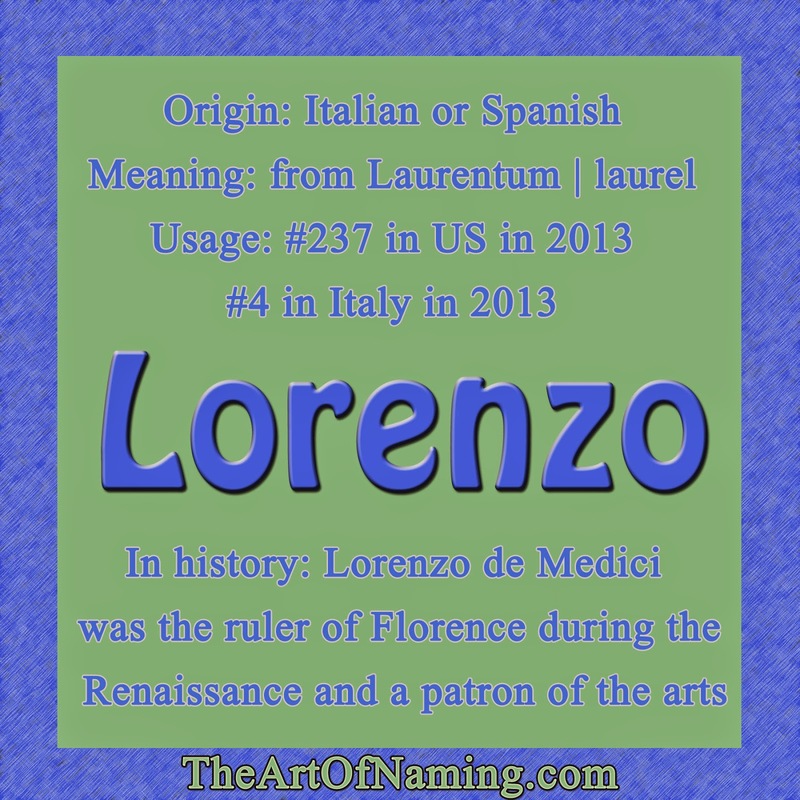 Lorenzo is actually both the Italian and Spanish form of the Latin Laurentius or Laurence. This name means "from Laurentum" which is a city in ancient Italy probably derived the Latin word laurus meaning "laurel". In history, Lorenzo de Medici was the ruler of Florence during the Renaissance. He was known as the Magnificent and was a patron of the arts. He actually employed great artists such as Leonardo da Vinci, Michelangelo, Botticelli and others. Click here to view other namesakes in history. Lorenzo currently ranks #4 in Italy and short-form Enzo ranks at #4 in France. Renzo is another nickname option or even Leo. This name has always done fairly well in the US too! It is one of those exotic but not too exotic choices that parents love. Since 1880, Lorenzo has consistently ranked in the 200-400 range. As of 2013, it ranked at #237 representing 1,498 total male births. 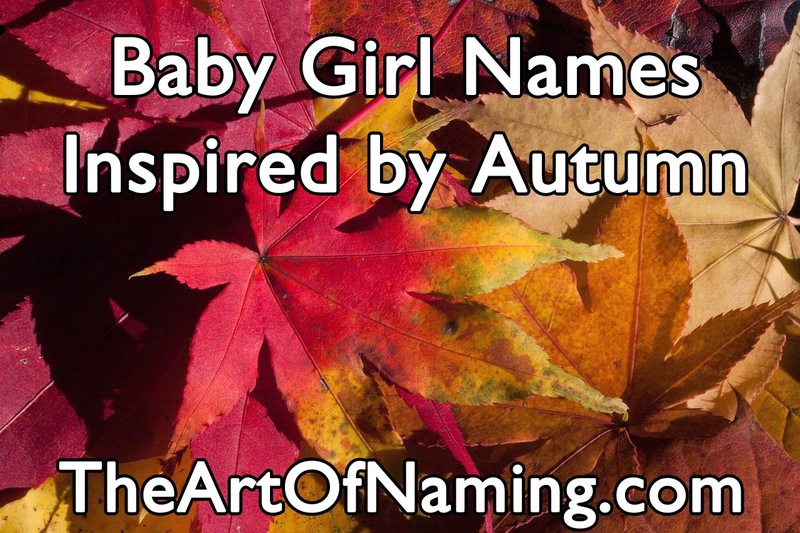 With crisp air, colorful leaves, bonfires and pumpkins in your mind, look no further than this list for some unique fall-inspired baby name ideas! Even though the first day of Autumn is still a couple weeks away on September 23rd, I thought we'd start pondering it as cooler weather approaches. If you're due with an Autumn baby in the next couple months and find yourself in need of the perfect name, perhaps you'll "fall" for one of these ideas! Which of these names do you like best? What would you pair with it? Leave your thoughts in the comment section! The first day of Autumn doesn't officially begin until September 23rd in the Northern Hemisphere this year, but I thought we'd start pondering it as cooler weather approaches. Perhaps you're due with an Autumn baby in the next couple months and find yourself in need of the perfect name. 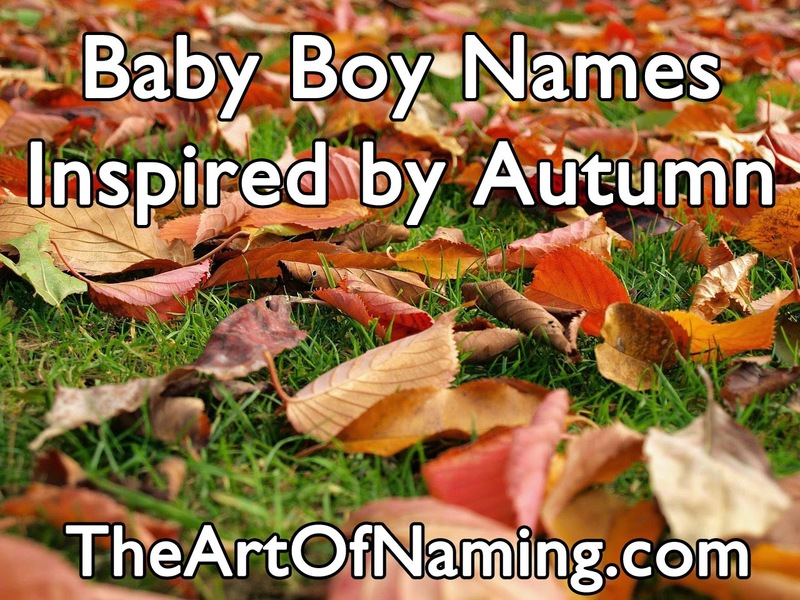 With crisp air, colorful leaves, bonfires and pumpkins in your mind, look no further than this list for some unique fall-inspired baby name ideas! Which of these do you like the best? Do you have any to add? Let me know in the comment section below!